← Will Melbourne be like Watts (L.A.) in 1965? Did poor public transport give Baillieu the election? Now that the dust has settled, there seems to be a solid consensus in many quarters that public transport was the key factor in the demise of the Brumby Government. There’s no doubt it was important, but perhaps it wasn’t as significant as assumed. 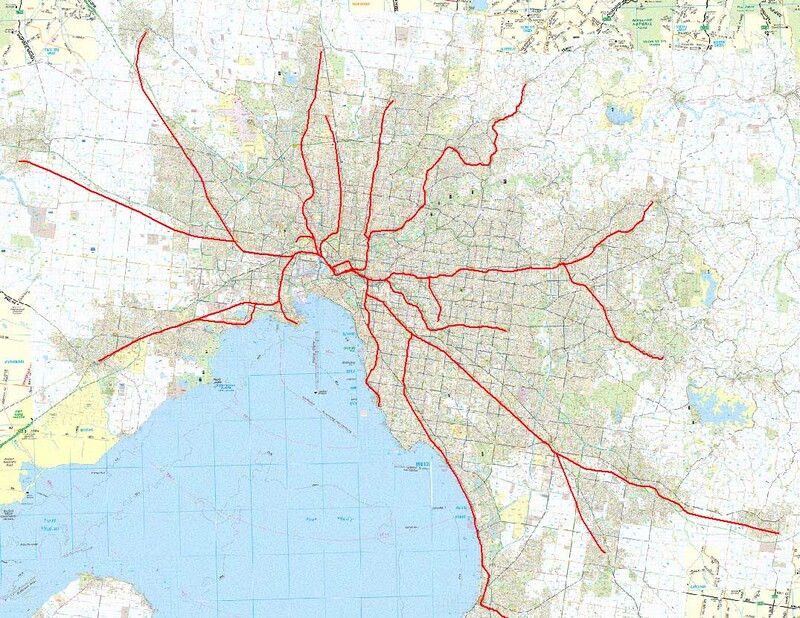 The most frequently cited example involves the loss of four seats in particular – Bentleigh, Mordialloc, Carrum and Frankston – which neatly follow the path of the Frankston rail line. 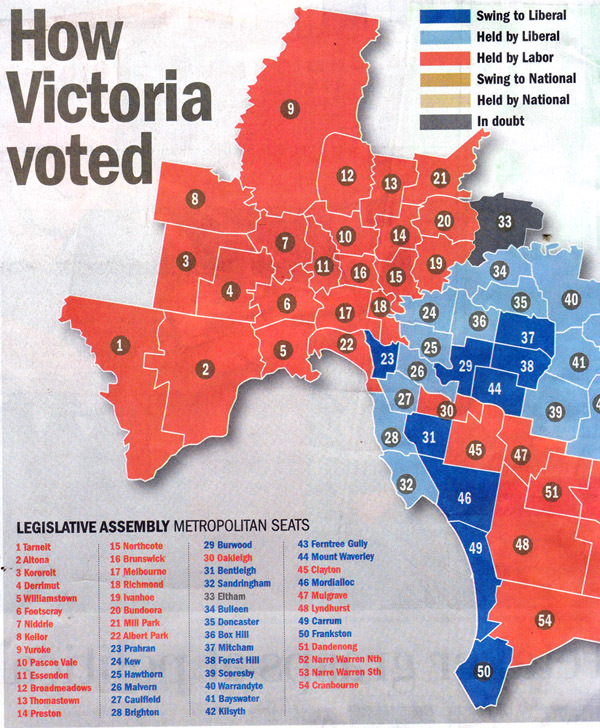 See the first chart (dark blue seats were won by the Coalition from Labor). Frankston is the least punctual line in Melbourne, with only 71.2% of trains running on time (i.e. within 5 minutes of the scheduled time) over the 12 months to September, with a low of 62.6% in May. In fact these appalling statistics gild the lily – conditions on all lines are far worse than the official figures indicate. As I pointed out back in July, train punctuality is measured over a 24 hour period, whereas the great bulk of passengers travel in the peak. Most delays occur in the peak because the headway between trains is considerably shorter than in the off peak and there is therefore much less margin for error. Thus the way punctuality is measured does not describe accurately the experience of most passengers because it measures the proportion of trains delayed, not the proportion of passengers delayed. Peak period punctuality on the Frankston line in May must have been truly shocking. It should consequently surprise no one that trains were a serious issue in these electorates. Yet Labor did not lose any electorates north of the Yarra even though, for example, punctuality averaged only 78.4% on the Werribee line over the last year and fell as low as 70.4% in March. Nor did Labor lose any electorates on the Pakenham line which, with a 12 month on-time average of just 72.5% and a low point of 63% in March, rivals the Frankston line for poor punctuality. These examples indicate that counting the number of electorates won or lost is a very crude indicator of the underlying issues. After all, some seats might have changed hands on a very small swing and others might have held despite a very large swing. The size of swings provides a better metric (see second chart) and gives a different perspective. For example, other than in Carrum, the magnitude of the swing in the electorates along the Frankston line was not as great as in many other parts of the metropolitan area, such as the west and parts of the north and east. 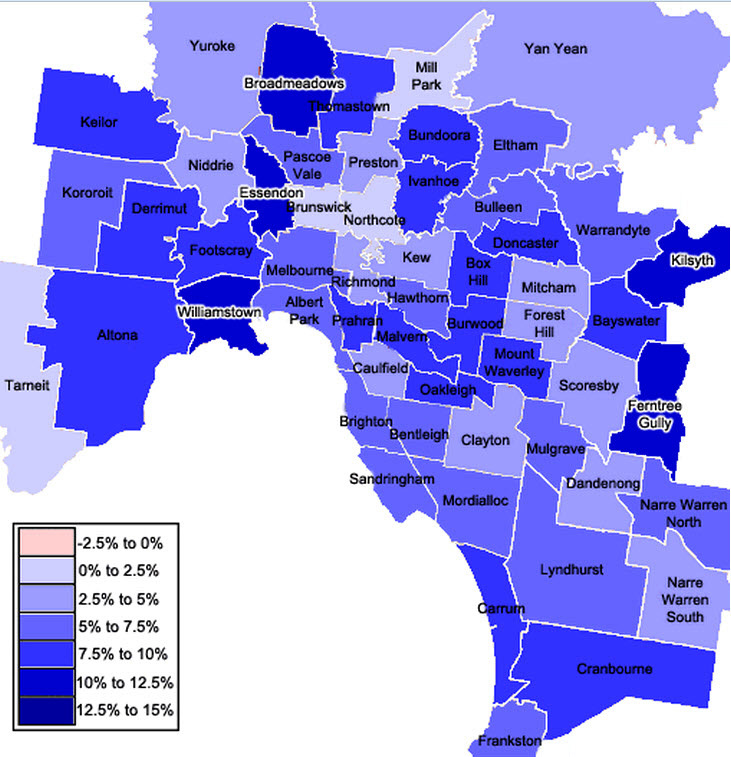 The eastern suburbs are particularly interesting because the electorates of Prahran, Malvern, Oakleigh and Burwood track the catchment of the Glen Waverley and Alamein lines. The Brumby Government suffered a big swing and lost three seats in this area. The surprise however is that these are the top two performing lines on punctuality. On average, 91.8% of trains were on time on the Glen Waverley line in the last year and 91.6% on the Alamein line. It would need a sophisticated multivariate analysis to sort out what contribution the many and varied factors that played out in the campaign made to the seat-by-seat swing. But on the face of it the pattern in the second chart doesn’t provide convincing evidence that the shortcomings of public transport were the key factor. That doesn’t mean they weren’t there – we know from many other sources that public transport was an important concern in suburban electorates – but it seems that non-transport issues, local matters and the peculiar demographics of each area were at least as important. And in future, the aggregate punctuality of the rail system should be reported publicly by weighting the timeliness of each train by the number of passengers carried.